The exquisite visual effects are a key element in the success of the THRIVE movie. The film continues to go viral, being passed word of mouth and hand to hand in families, workplaces, communities and networks in 25 languages around the planet. The 3D animation and visual effects are the work of Goa Lobaugh and his team at liquidbuddha.studios. We have received messages of gratitude from healers, scientists, spiritual teachers, inventors, researchers, historians, children and more — thanking us for depicting the geometries of nature in a way that makes the invisible visible and honors its beauty. Goa had a profound insight years ago that part of his calling this lifetime was to use computer graphics for the transformation of human consciousness at this critical time. That commitment, together with his understanding of geometry, was directed by our script and his own strong inner guidance to manage 1.8 million files and produce the result that has touched millions of hearts and minds in cultures worldwide. In the process of creating these artistic masterpieces, Goa and his team also created a visual effects toolset that saves time and shares understanding for others wanting to represent nature’s fundamental patterning in virtual imagery. The toolkit includes fast creation of animated toroidal evolutionary wavefronts, phi-spiral vortices, jitterbugging vector-equlibriums and more! Now liquidbuddha.studios is generously making the “Cosmic Geometry Toolkit” available as an open-source project on GitHub. Interested artists, geometers and visual effects specialists can find out more about the toolkit. Goa continues to work with Thrive as a Managing Director for ThriveConnect, and also supports new energy teams with 3D printing services and consultation. 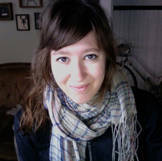 The 2D animations in THRIVE were created by Michelle J. Enemark who works in Brooklyn, New York. Michele was the top choice in our nationwide search for the sort of skill and creativity that we needed to communicate challenging and vital information in an entertaining and memorable way. Hi everyone! I’m very excited to be here to show you what goes into making an animated sequence for THRIVE. I’ll take just one scene and break it down for you. The first thing I would do is cut it out from the surroundings to isolate it. I’ve cut it out here. I’ve changed the coloring a little bit. I’ve added the flags. I’ve added the “Grand Opening” sign. Here is my Garden Café title. The last thing I do is add this texture effect, which kind of gives it more of a handmade look, sort of illustrated. I do this to every single photographic element in all the animation. Then, once I’ve done that for every single element for the scene, I go into Illustrator and I create my characters. The reason I do these in Illustrator is because they can scale up forever; they’re a vector graphic, which means they can be as big or small as they would ever need to be and they never lose their resolution. Now, I’m going to take all these (all of my silhouettes, all of my elements) and bring them into After Effects. I put them all together in one scene. Basically, I just lay everything in, get it looking the way I like it, and then I put everything into a 3-D space. For example, this woman, I want her to be in the foreground. If I were to push her into the background more, she gets smaller. If I pull her close, she gets bigger. This is so that when the camera passes by, she looks like she’s in the foreground. She moves faster because she’s closer to us. Then, I know I’m going to have a butterfly animated in the scene, so in a separate composition, I bring both the butterfly and the Grand Opening scene into this huge composition of all of the scenes that are going to be in this animation. This is where I also add the sky, the grass, trees, background elements, and you can see as I scroll past how long and how huge, just everything that’s going to be in the animation so that when I actually start animating movement, it’s all there. Then, I bring it into my final composition. This is where I add my camera, which you can see down here, it shows I’m scrolling past. I’m moving in. I’m moving out. This is the animated final product. Thanks so much for listening and I hope this shed a little light on what goes in the making of these animations. I’ve had a great time working on them and I can’t wait to do more. You can see more of Michelle’s artistry and contact her on her web site. We are forever grateful to Michelle and Goa for putting wind beneath our wings and inspiring us and over 23 million others. These clips are indicative of what is available on our THRIVE DVD as “Bonus Extras.” We encourage you to purchase the DVD and share it with friends. You can find it in 10 languages on our store.